​These Pictures are "Painted" with Paper! No "mixed media" here - all made with bits of paper from magazines and catalogs. To see more , click on "Gallery" in the Menu above. 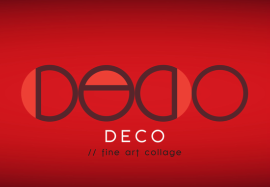 ​To read about Deco's unique approach to collage, click on the "Contact" tab. Copyright pending on all images and text. All rights reserved.es. All rights reserved.